This weeks post is a guest member post by Elizabeth Richardson. Elizabeth is a sustaining member of The Junior League of Oklahoma City and is the owner of Adorn OKC. Hooray! The holidays are here! Time to get your front entry and outdoor planters looking festive for the season. 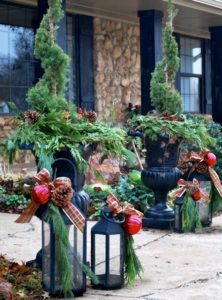 I’m excited to share container gardening tips to ensure festive curb appeal for your home or business. Thanks for reading along! First, the basics of container garden design. I use a super simple design concept in all my outdoor pots – thriller, filler and spiller. I start with picking out the thriller. The thriller is the one tall plant or decor in the container that gives the arrangement height. Next, I pick out the fillers. The fillers fill in around the middle of the pot. Lastly, I select the spillers. These beauties cascade over the edges of the pot. It’s so easy…thriller, filler, spiller! Since it is the most wonderful time of the year…let’s talk about some of my favorite thrillers, fillers and spillers for festive holiday planters. Evergreens are my thriller of choice for winter planters, but other good thriller options are red twig dogwood branches or birch logs. Depending on the size of the planter, some good evergreen thriller options are leland cypress, boxwood, arborvitae and dwarf Alberta spruce. Next comes the filler, which fills in around the middle of the planter. My favorite fillers for the holidays are pinecones, berries, live evergreen branches and ornaments. Lastly, come the spillers, which cascade over the side of the planter. Great spiller options for winter are english ivy and fresh evergreen garland. Note…the fresh garland and cut evergreen branches will stay fresh longer if sprayed with an anti-transpirant solution like Wilt-Pruf once you arrange it in the planters and then misted with water daily. In the picture, I’ve used a dwarf Alberta spruce topiary as the thriller, pinecones and berries as filler and ivy and garland as spiller. Doesn’t it look festive for the holidays? Once the holidays are over, just remove the pinecones, berries and garland and the dwarf Alberta spruce and english ivy will look great all winter long. I have plenty of other examples of holiday planters on my website, www.adornokc.com, or you can follow Adorn on Facebook or Instagram for pictures and videos posted daily. Cheers to fabulous curb appeal this holiday season!